Everyone loves candy and treats on Halloween. You may be wondering if your dog can eat candy as well. While dogs should not be fed commercial candy (especially not chocolate! 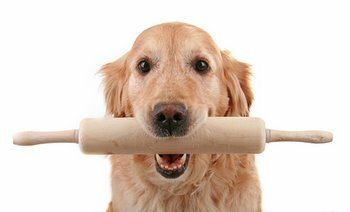 ), you can make healthy and safe snacks using this simple homemade no bake dog treat recipe. This recipe from PrettyFluffy.com provides a great way to make quick, tasty dog treats. 1. Whisk the yogurt and peanut butter until it forms a paste. 2. Add the oats 1/4 to 1/2 cup at a time ensuring they are fully coated and no dry spots form. You will be left with a heavy mixture. 3. Scoop out bite sized pieces with a spoon and roll into little balls. 4. Place on a flat tray lined with baking paper. 5. Pop them in the fridge for one hour to chill, then serve. Keep in mind that dogs cannot eat common ingredients such as chocolate, grapes, raisins, onions, garlic, macadamia nuts, excessive salt, or foods containing xylitol, a low calorie sweetner. Avoid these ingredients completely! If your dog ingests human candy or treats, be sure to have him seen by your veterinarian immediately to prevent toxicity as well as vomiting and diarrhea. Make sure pets are safe this Halloween and keep food and these candies out of their reach!